The jART agent Platform is a software framework developed to integrate real-time agents with other agents without temporal restrictions. jART complies with FIPA specifications allowing the programmer to develop real-time agents which are able to communicate with other agents using the Agent FIPA-ACL. jART also allows the programmer to incorporate critical tasks into the system, which are basic to solving real-time problems. 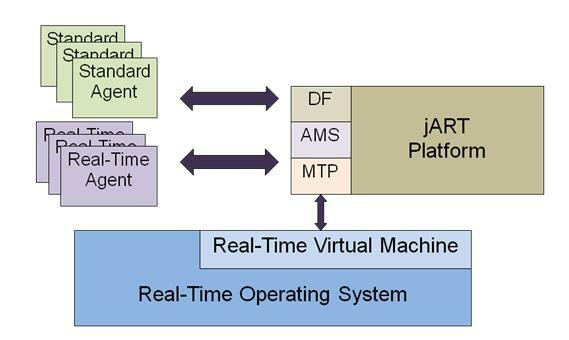 This software architecture is executed in a Java Virtual Machine (VM) which must comply with the specifications of the Real-Time Specification for Java (RTSJ) proposed by the Real-Time for Java Expert Group. In order to ensure the correct execution of the VM, a RTOS (Real-Time Operating System) below the VM is necessary.